Video game retail is dying. It has been for years now. Digital distribution is the future, even if Microsoft’s attempts to usher it in with the Xbox One turned out to be slightly premature. Steam has shown that minimising overhead benefits both gamers and game makers, with cheaper games leading to more sales and vice versa. The arrangement has proven a clear win-win for the PC side of the industry. Only traditional retailers missed out, but they had seen their inevitable obsolescence coming from a ways off and shifted focus to the then physically-bound consoles. For a time, everyone was happy. Now, though, the cycle is repeating. It’s the consoles’ turn to sever their ties to pressed discs and limited stock. As reports like that of the Electronics Software Association show, gamers are spending more on digital games than physical ones, and that trend is only going to increase. Gamestop and its ilk have no easy retreat this time. That much is plain to see in Gamestop’s desperate scrambling to sustain its used-games economy, the source of its greatest profit margins and its one remaining buffer against the digital storm. Sadly, its resistance is futile; publishers have long decried its reselling practices, as the push for the online-pass initiative proved. Whether it be an industry mainstay like EA or a small outfit like Re-Logic, the low-cost, high-returns landscape of digital distribution is much more appealing than letting Gamestop line its pockets. Gamestop becomes the new arcade. Think about it. Arcades left their prime behind decades ago. A few live on as historical curiosities or under the ‘barcade’ banner, leveraging the timeless appeal of alcohol to fuel the nostalgia. The rise of home consoles saw the death of the arcade, but Gamestop could turn that on its head. It’s simple: take those half-arsed demo kiosks and turn them into fully-fledged game stations, with extra controllers for multiplayer and external hard drives loaded with the latest games. Stick a bunch of these booths in a dedicated section at the back of the store, so the flashing lights and booming sounds can intoxicate the entire store. Use those big TVs hanging on the walls to display live streams of the top games and gamers, maybe even including shoutcaster commentary during organised competitions. That would be a damn sight more interesting than those chintzy ads they currently display. Entry into the arcade section would be free but time-limited, with that limit varying depending on the game and current demand. Conditions like these would need to be clearly advertised so as to prevent their abuse. When a player’s time runs out, a message would inform them that they could download or upload their progress for the next time they play - and oh, hey, did you have fun? Maybe you want to go ahead and buy the full game? Just hit the Purchase button and an employee will ring you up with a download code - perfect if you don’t have a credit card linked to your online account. Head on home to continue where you left off, or maybe keep right on playing in-store if the place is quiet enough. If your home console’s in rest mode, you can even start it downloading straight away so it’ll be ready to go when you get home. This kind of try-before-you-buy model harkens back to the bygone age of demos and trial versions, only without the irrecoverable development costs that led to their extinction. By making it a social experience, consumers will be more likely to take the plunge on something new - such is the infectious power of grinning faces and triumphant cheers. The smart move on Gamestop’s part would be to take cues from the sleazy yet savvy casino business and provide complimentary refreshments, sociable attendants, and bombastic celebrations when players earn achievements and high scores. One need only look at the astronomical revenue of the gambling industry to see that, from a purely commercial perspective, it knows what it’s doing. Atmosphere and service are Gamestop’s greatest weapons in the battle for its survival. Shopping digitally cannot yet - and might never - recreate all the quirks of physically browsing a store: checking out the competition, unearthing a buried bargain, exchanging stories and advice with fellow consumers. A neo-arcade could harness the excitement of playing games and extend it to the act of purchasing them, giving consumers a legitimate reason to trek to their nearest store instead of simply clicking the Buy button from the comfort of their couch. It’s how LAN parties have remained viable in the face of the ubiquitous internet; pomp and circumstance can trump convenience when used wisely. Humans are social beings. The collaborative way we work, learn, and play reflects that. 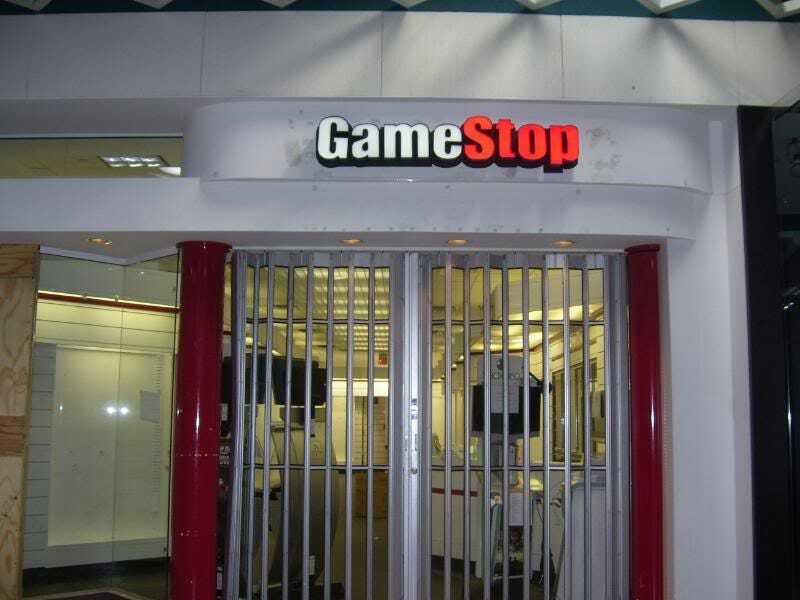 Gamestop doesn’t need to die just because its business model does. Stop focusing on the product and start putting more effort into the experience. We gamers are willing to pay for good service; just look at the success of GOG’s no-DRM stance, or the overwhelming support for Sony’s consumer-friendly PS4 launch. The digital future is upon us, and if Gamestop wants to survive the sea change, it must remember one simple truth: games are fun. Maybe buying games should be fun too. And Gamestop? I’m here if you need to hire a consultant. Just saying.